Henry Louis ("Lou") Gehrig (June 19, 1903 – June 2, 1941), born Ludwig Heinrich Gehrig, was a MLB baseball player active in the first half of the twentieth century. He set several Major League and American League records and was voted the greatest first baseman of all time by the Baseball Writers' Association. His record for most career grand slam home runs (23) stood for almost 75 years until it was passed by Alex Rodriguez. A native of New York City, he played for the New York Yankees until his career was cut short by amyotrophic lateral sclerosis (ALS), now commonly referred to in the United States as Lou Gehrig's Disease. Gehrig was known as "The Iron Horse" for his durability. Over a 15-season span between 1925 and 1939, he played in 2,130 consecutive games. 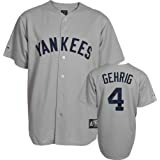 The streak ended when Gehrig became disabled with the fatal neuromuscular disease that claimed his life two years later. His streak, long believed to be one of baseball's few unbreakable records, stood for 56 years until finally broken by Cal Ripken, Jr., of the Baltimore Orioles on September 6, 1995. Ripken would go on to play in a total of 2,632 consecutive games through September 20, 1998, setting the current record. Gehrig accumulated 1,995 RBI in seventeen seasons with a lifetime batting average of .340, a lifetime on-base percentage of .447, and a lifetime slugging percentage of .632. A seven-time All-Star (the first All-Star game was not until 1933; he did not play in the 1939 game, retiring a week before it was held — at Yankee Stadium), he won the American League's Most Valuable Player award in 1936, an equivalent award in 1927 and was a Triple Crown winner in 1934, leading the American League in batting average, home runs, and RBI. Lou Gehrig was an RBI machine. Below are the stats for his award winning years of 1927 and 1936, plus another two of his most productive seasons. For his career stats, click here. 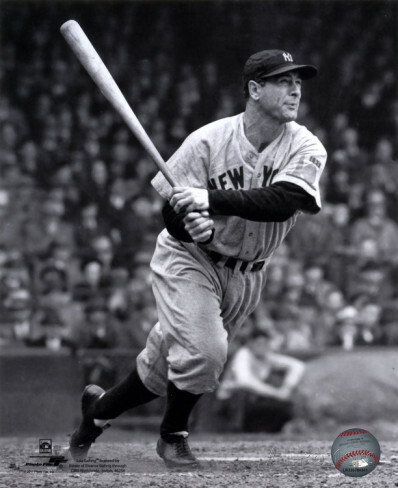 Featured here are Lou Gehrig posters, photos, giant collectibles and apparel.